As it is the Summer holidays I thought I’d share a recipe that my Mum used to make for us to keep us happy. She used to use the crumbs from the bottom of the biscuit tin to augment the bought biscuits in this recipe. If you were lucky you got a bit of bourbon, the unlucky ones got a bit of elderly Rich Tea but when you are little that doesn’t really matter. I am pretty certain she used CakeBrand chocolate covering too. I use proper chocolate in mine although I was tempted to tip in the biscuit tin bits I can tell you. Vary the type of chocolate on the top of the tiffin too depending on your preferences. See my note at the bottom about other additions to the mix as well. I have just had a thought, next time I’m making a ginger biscuit version with dark chocolate and a few chunks of crystallised ginger. In fact, I think next time might just be now! In a mixing bowl, using the end of a rolling pin, crush the biscuits into crumbs. You could use the fill a plastic bag and whack with a wooden spoon method if you want. You could use a food processor but that takes all the fun out of it. Pour the chocolate sauce onto the biscuit crumbs and combine thoroughly. Tip the chocolaty rubble into a buttered round sandwich tin and press down. Put into the fridge to set. Once set melt the chocolate and pour over the biscuit base. Refrigerate once more until the chocolate is set. Cut into wedges and serve. This is best served from the fridge as it is only the cold that holds it together. The sheer chocolate ness of this cries out for the addition of some fruit. I like to add snipped up dried apricots into the biscuit base. Add in whatever you fancy. I love dried apricots with a dark chocolate coating or cranberries and add a white chocolate topping. You can see from the top of this post that I have decided to enter this Tiffin recipe into the Alpha bakes round up as the letter is T! Hosted in turn by The more than occasional baker and Caroline makes I have often thought about joining in and I finally got round to it. 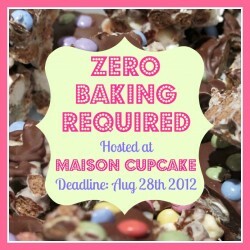 I have also added it to Zero Baking Required which is being hosted by Sarah of Maison Cupcake. ← I held an Olympic bouquet. Ooh looks lovely and the ginger version sounds great! Making it later this afternoon. Can’t wait! Looks absolutely delicious! I would so love to try some. I am sure they taste amazing. Thanks for entering this to AlphaBakes. 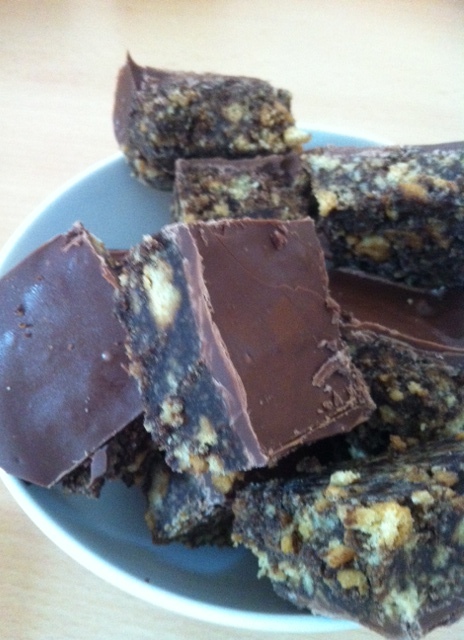 I love making tiffin as they are so versatile. I love your mums approach in using the biscuit tin crumbs – no wastage – brilliant! Yummy!! I love tiffin! And these look amaze! Hi I am dropping by via Alphabakes… I have never heard of tiffin before but they look really delicious. I sure would love to try them.